Bluetooth headset. Hearing protection with integrated AM/FM radio stereo and Bluetooth connection. AM/FM DIGITAL BLUETOOTH HEADSET. 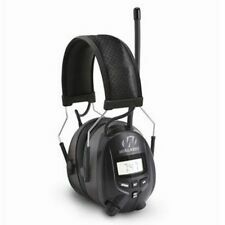 AM/FM Digital radio muffs NRR25. Comfortable foam cushions for extended wear adjustable stainless steel headband Save up to 10 radio station preset, Seek/scan. 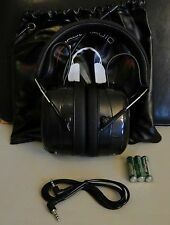 NEW, Unused, Vintage Suntone AM/FM Foldable Headphone Radio Black Color. Model RR406 Comes with 2 Toshiba AA batteries. Cannot guarantee the batteries are working as they are from 1995. Purchases of 3 or more receive a discount on the order. Can't stand the noise of Lawn Mowers?. ►Can't stand the noise when woodworking?. ►You need it, It is not only an ear defender to protect your hearing, also a great headphone to make you more enjoyable►Best gifts for your parents to listen radio or music. DEWALT MODEL DPG15. HEARING PROTECTOR. 8 radio station presets per band. Digital AM/FM radio tuning with LCD display. • SENS (sensitivity) LOCAL/DX selector for better reception. • A total of 20 channels can be preset, 15 FM channels and 5 AM channels. • FM flexible antenna. • Digital clock display. Upgraded technology and programming enables use in other countries. Adjustable stainless steel headband and soft, comfortable gel ear cushions. Voice Assist low battery indicator, with a redesigned battery cover with hinge to minimize breaking. Trending at $43.02eBay determines this price through a machine learned model of the product's sale prices within the last 90 days. 3M MODEL 90542. DIGITAL EARMUFFS. Features a rotary tuning dial so you can operate your Bluetooth wireless technology enabled device from the headset, eliminating cords. Audio assist technology provides setup and operational guidance without having to remove the headset. Trending at $75.48eBay determines this price through a machine learned model of the product's sale prices within the last 90 days. Be assured all materials are clean and sanitary, we know the origin of the material and what each piece has been used for. Deluxe stereo headphones. Built-in speaker. Built-in belt clip. NEWEST Version! USE w/ iPod & MP3 / FREE SHIPPING! Sony Walkman SRF-H4 AM/FM Radio Stereo Headphones. Submitted for your approval, we have a used Sony SRF-M40W AM/FM Digital Walkman Radio with original Sony MDR-010 Headphones. Unit is in well used condition with significant scuffs and scratches from use and is missing the belt clip. Model SRF-39. I will do whatever I can to make things right! MSA SAFETY MODEL 10121816. The MP3/AM/FM Stereo Hearing Protector Ear Muffs Balance Comfort, Protection And The Ability To Listen To The Radio Or MP3 Player. DIGITAL HEADPHONES. DIGITAL RADIO/MP3. Clean and tested in good working condition. External Source 3.5MM Earplug. Digital Tuning and Display: With the digital LCD screen and the tuner, you can easily to know AM/FM channels you are listening to and adjust the frequency quickly. Auto-search and Save Channels: This portable radio could auto-search 20 am or fm channels and save them automatically. 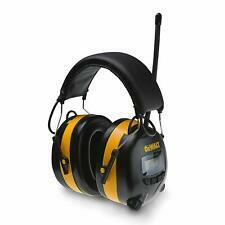 Professional-Quality Hearing Protection (31dB NRR). Compatible with iPod & MP3 Players. Antenna with high reception sensitivity. Pre-set up to 16 stations (8 AM / 8 FM). NRR Material: Foam. Frequency: FM 87.5 â“ 108.00 / AM 520 â“ 1710. I will work with you to make things right. WHAT YOU SEE IS WHAT YOU GET. THIS IS WHAT YOU ARE GETTING.